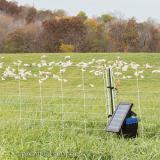 When properly energized, 35" tall ElectroNet is a nearly impenetrable mesh to sheep, goats, coyotes and dogs. Because it’s so easy to install and remove, many move ElectroNet weekly—fencing the flock or herd instead of an entire pasture. 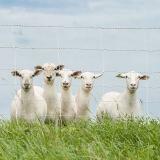 Its very low electrical resistance (38 ohms per 1000') is important for fences that are either long or will experience high weed contact. 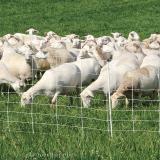 It's also available as a Pos/Neg fence for dry, sandy or rocky conditions. 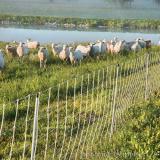 Ideal for situations when there is too little moisture in the soil to properly ground the fence. 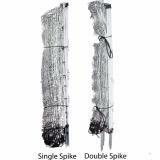 ElectroNet® 9/35/12 is 35" tall and has 9 horizontal strands (8 conductive) with vertical struts every 12". Built-in line posts (0.51" dia.) are spaced every 12'5". 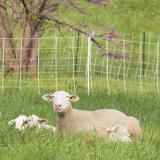 Choose the Pos/Neg option when there is too little moisture in the soil to properly ground the fence. ElectroNet® 9/35/12 (with drivable posts) is best suited for dry, hard or rocky soil. The 0.75" dia. posts are much stronger and stiffer than standard line posts and can be pounded in with a dead-blow hammer or mallet. Brown drive-caps indicate these posts are drivable. Available Pos/Neg option for dry conditions. ElectroNet® Plus 9/35/12 is identical to standard ElectroNet, but to help with sagging, we’ve added more posts to shorten the distance between them (6'8" vs. 12'5"). Adapts easily to uneven terrain. 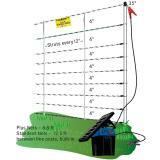 Distance Between Line Posts 12'5" 12'5" 6'8"
Post Diameter 0.51" 0.75" 0.51"
Select an energizer kit (includes charger, ground rod and wireless tester). Add support posts as needed for ends, curves and corners, and any accessories.